While we quibble about public-private partnerships to build roads (and John Key even uses the public/private concept to support government getting into the private sector ie KiwiBank buying into the home loan industry) here's a government getting out of maintaining existing highways. In the biggest highway privatization deal in U.S. history, state officials Wednesday signed an agreement Wednesday to turn the 157-mile Indiana Toll Road over to a foreign consortium that will operate it for a profit for the next 75 years. I supose the cops had nothing better to do. We all know the UK is a crime-free haven. So Herefordshire police had time to seize three golliwogs from an alarmed shop-owner who thought, when he was urgently called to his premises on a Sunday, a break-in had occurred. "The long suffering public is growing weary of reading about revolutionary advances in the world of medicine when it knows that in times of trouble it is nothing short of an achievement to gain admission to a public hospital to be treated by conventional means....last month Wellington Hospital's waiting list was suspended for two weeks because of an unusually high demand for beds and shortage of trained staff." The column goes on to detail the numbers waiting for treatment at Wellington and Hutt hospitals and the new Health Minister's plan to cut the waiting times and lists. Can you guess which year this was? TUB-THUMPING speeches, the climax of selection contests in the Conservative Party for generations, have been axed by David Cameron to try to increase the number of women MPs. New rules sent to 100 target seats this week say that set-piece speeches must be replaced by an interview in front of the full membership, to be conducted by a local dignitary, journalist or professional from outside the party. The traditional barn-storming speech is thought to give men, with their deeper voices and often lengthy experience of public speaking, an advantage. Speech-making is my achilles heel but I think it's requisite for an MP. Either you get better at it or compensate by being very good in other areas.... Then again politics is changing fast. Turn out for public meetings is very low. Getting your message to voters via the media is more important..... Then again, media cover meetings and won't be kind to a poor speech-maker. No. This seems like a mistake to me. What do you think? We made the Newstalkzb News and a Herald photographer took some shots. He said he couldn't resist coming down, after hearing my call to the radio, to see what sort of nuts would be protesting in a southerly storm. Committed ones. The US Tax Freedom Day is April 26, out 3 days from last year and ten from 2004. How long do we have to spend working for the government, rather than ourselves? The answer is nearly half the year. 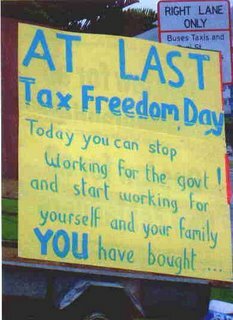 Last year, Staples Rodway declared May 24 to be Tax Freedom Day in NZ and May 17 in Australia. 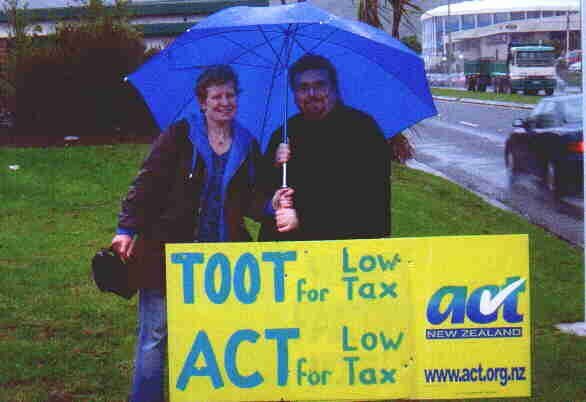 According to the NBR Tax Freedom Day -- that magic point in the year when New Zealanders begin working for themselves, rather than the tax man -- will come a week or two later this year. Enjoy your holiday because when you go back to work on Tuesday (or tomorrow) you'll still be working for the state! 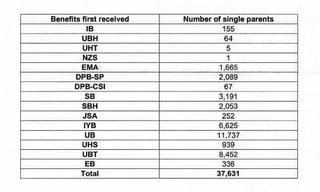 In 1990 27,830 were on an invalid's benefit. Today there are 74,500. People on this benefit for psychological or psychiatric reasons make up 27 percent, the highest incapacity group. In 1990 48 percent of invalid beneficiaries were under 40 - that has dropped to 30 percent, which reflects our aging population. The percentage that are female has grown from 40 to 47. 75.3 percent have been on this or another benefit continuously for four or more years. 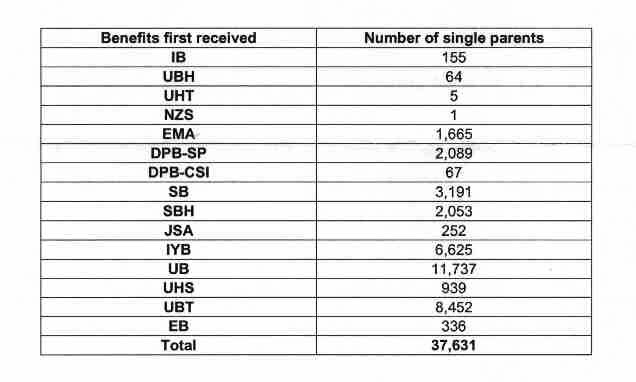 In 1990 28,351 people were on a sickness benefit. Today there are 46,862. 51 percent have been on it for more than a year. In 1990 only 29 percent had been on it for more than a year. Today, more people are sick and they are sick for longer. Really. It doesn't inspire me - as quotes go. In fact, in politics I would have thought, knowing what is right is easy, the problem is doing it. That would be a better motto for National. This chart (the result of a PQ from Simon Power) shows the number of CYF placements over the past five years. Family/whanau placements, foster care or youth justice residences. The top figure is also included in the bottom but assuming the numbers have been recorded in the same way each year the increases are quite staggering. It isn't unusual to hear people talking about routinely providing beneficiaries with a food voucher instead of cash, to ensure that children actually get fed. I point out that food stamps can also be manipulated and used as black market currency. Illinois, US has tried to get around this by using electronic cards regularly credited with funds to be used only at authorised foodstores. But that is still being ripped off. A welfare recipient goes to a store with a Link card credited by the government with a dollar amount for groceries -- say, $100. The store clerk swipes the card through a government computer and takes credit for $100 in phony food sales. Then, the clerk hands $70 to the welfare recipient, keeping the rest as profit. Food-stamp benefits can be legally used only to buy "food or food products for human consumption, plus seeds and plants for use in home gardens to produce food," according to the USDA. But over and over, federal authorities have watched food-stamp recipients, who find out about crooked stores through word of mouth, use illegal cash from their Link cards to feed their drug habits, not their families. Baker said the fraud is especially insidious because the family members of Link cardholders often wind up having to stand in line at food pantries for handouts because the Link benefits have been squandered on drugs. And, just to add insult to injury, it appears that some of the ripped off funds are going to terrorist organisations. One thing the public always seem to support is more money for nurses. That is, when it comes from the government. It will be interesting to see if they are so keen when they are asked for it directly on their next visit to the doctor. The Nurses Union are threatening that GP fees will rise if the government doesn't stump up with the extra $22 million they want. On one hand, I am always pleased to see user-pays in action. On the other, people have already paid for the nurses through taxation. People should of course be angry and ask again, why are we paying twice? The British Conservatives have signed up to Labour's child poverty reduction target. BUT it is up to the supportive state to make child poverty disappear. So says Oliver Letwin, head of Conservative Party policy UK. "It is a problem of demoralised neighbourhoods, of broken families, of drug and alcohol dependency, of poor schooling, of poor housing and decrepit estates, of unemployment and unemployability, of children growing up with too little hope and too much fear." These problems, Mr Letwin said, could only be dealt with "bottom up, from the locality, from social enterprise meeting local needs" – local campaigners were the "heroes" and it was up to the state to set up the framework in which they could flourish. "It is not the commanding state but the supportive state that we need: enabling society to support, inspire, mentor and lead young people out of deprivation," he wrote. As long as the state keeps paying for all of the afore-mentioned, that is what we will get. How we describe the state won't make a blind bit of difference. Then the Guardian asks, What would Margaret Thatcher think? Certainly the Conservative switch is unlikely to have been entirely altruistic. Any party trying to remove its "nasty" label needs to do something dramatic. Inequality has become so familiar it is easy to forget just how rapid its growth was under the Conservatives in the 1980s. Three decades into the welfare state, both inequality and relative poverty in Britain were at their lowest points in 1979. Seven years later child poverty had tripled: from one in nine to one in three living below the poverty line. No other country except New Zealand suffered such a brutal reverse. Child poverty is largely bound up with sole parenthood. Yet it is discussed in terms devoid of any association. The state paid for it - the state got it. When the state started doing it, the politicians of the day most certainly would have described themselves as proponents of a "supportive" state. This is my friend Michelle. 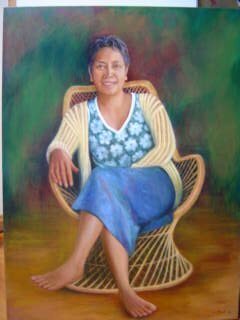 She sat for my portrait entry in this year's National Portrait Competition, currently showing at Shed 11. I am delighted to learn the painting is one of twelve selected for a further exhibition "Double Exposure 3" to be held next January in Wellington. I believe it has been selected because of the subject. My aim was to capture Michelle's warmth. The painting itself was a rush job but it must have "connected". Minister for Social Development, David Benson-Pope announces another scheme to spend taxpayer's money. "It's estimated that up to 45,000 15 to 19 year-olds do not enrol in tertiary study or get a job after leaving school. This is a waste of human potential," said Mr Benson-Pope. That is as clear as mud. 45,000 over what period? Whatever the period, it is 45,000 too many. So the answer from the government is to pour more money into services to get these people into jobs. Wouldn't it be far simpler to take away the alternative to a job? Why oh why are we giving welfare to kids straight out of school? So sitting around on the dole or independent youth benefit is a pathway to pregnancy. Police have charged three men with the same drink-driving offence because they could not establish which one was driving the car. They surely cannot be convicted. Defence counsel Sonia Vidal said she had huge concerns about the legality of the charge. Police had charged all three because they did not know who had been driving. They have no proof of who the driver was or the exact vehicle that was driven so police have entered the house and charged all three flatmates. I have huge concerns about the legality of many steps in the process. Queenstown men Cameron Milford Hoyle (23) and Phillip Parker (24) are also charged with dangerous driving and with driving with breath-alcohol levels of 856mcg and 763mcg respectively. They are due to appear in the Queenstown court on April 24. Judge Flatley said he could not understand how police would get over the burden-of-proof threshold. What a surprise to see the name Frank Macskasy on the front of the DomPost this morning. 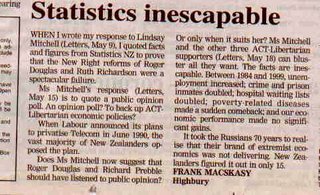 It usually appears on the letters page after another go at the failure of the 80's reforms. 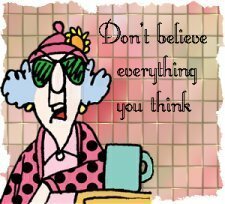 On more than one occasion Frank accused me of "living in a world of her own" or "determined to ignore the evidence". It was always his contention he dealt in the truth. Yesterday, in the Upper Hutt District Court, a Frank Macskasy admitted a fraud charge of stealing a dead baby's identity to obtain a passport. He was remanded for sentencing next month. US Correspondent Steve Merczynski speaks to Newstalk ZB host Larry Williams about phone calls played in the trial of Zacarias Moussaoui. One is replayed from a young woman on the 83rd floor of the South Tower. I can't listen to it again. But we shouldn't forget the enormity of the horror, the great sadness of that day and the years following for families and friends of the dead. On how many counts can Hone get it wrong? 1/ And I have fired people for smoking in the wrong places. It hasn’t made me the most popular son of the North, but as Errol Flynn once said “frankly I don’t give a damn”. Tobacco is killing my people, and I will use every weapon to defeat this monster. 2/ Liberals will say though that smoking is about Maori people making choices. But I say no. HELL NO!!! because tobacco companies use their structures, their policies and their practices to oppress our people in the same way as government agencies have. 4/ And honestly folks, getting rid of tobacco is the only logical conclusion to the work you and many others have been doing for years. It makes more sense than just trying to manage the impact of tobacco. 5/ And I look forward to when Maori people can finally enjoy the same rights and privileges as everyone else, because we have given so much, and because we deserve better. Statistics from the Integrated Dataset on Student Loan Borrowers show that borrowers under 25 years, and those aged 60 years and over, had the highest median amount transferred for 2004 from StudyLink to Inland Revenue, Statistics New Zealand said today. I have a question (when don't I have a question?) As a student loan only has to be repaid when a certain earning level is reached, $17,000, which is more than a single person's Super, do people over 60 expect to repay their loans? 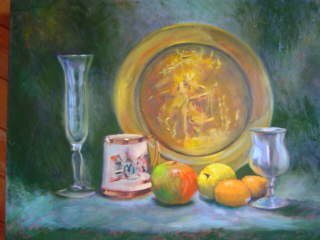 Still experimenting with still lifes. I never use black but I was given a tube so I've been mixing it with a lemony yellow which gives a deep, not too raw, green. The Scotsman reports an Australian Federal Police officer was using a Scottish pyshic to help investigate a threat on PM John Howard's life. The Australian Labour Party spokesman for homeland security, Arch Bevis, said he would be greatly concerned if the AFP was using clairvoyants to hunt criminals and terrorists. "I think, perhaps, this fellow has watched a few too many of the US detective shows," he said. Some good work here by Simon Collins, the Herald's social issues reporter. He has attempted to establish how many Maori children have a parent on a benefit. He arrives at 45.9 percent. Population estimates for June 2005 show around 264,000 Maori 0-17 year-olds which would put the percentage at 35. But, as Collins points out, there was some double-counting in the Census which, in turn, is used as a base for further estimates. In 2001 it amounted to 130,000 children being counted twice. So who knows what the true percentage is. Here-in lies the problem of counting people in more than one ethnic group. Which is also one of the reasons I oppose the statistical concept of two-home children. More double counting, more vagueness. Probably the best we can say currently is that between one in two and one in three Maori children are being raised on a benefit. On opposite pages of the DomPost this morning we have two very different minds. One which sees the problem and another which thinks it does. The first is Michael Bassett with his column "Taming the feral breed". Bassett attacks the dog micro-chipping strategy as "placebo" politics and goes on to the broader picture in which the same sort of politics is now routinely practiced by our "student" politicians; "But till such time as the great welfare recruiting ground for under-achievement and consequent anti-social behaviour is faced up to, nothing offers more than temporary relief." Then we have the benefit of the wisdom of Murray Edridge, Barnado's CE, urging the repeal of section 59 to "save lives". "The sooner NZ society stops giving ambiguous legal signals on violence in the home, the better it will be for our children. Our laws set a standard, and ensuring that standard is clear and unambiguous is the first step in social change. The standard in itself does not change behaviour. Our law is very clear and unambiguous, for example, about murder or theft. These crimes continue to occur, but in the knowledge they are wrong. In the same way, repeal of section 59 will make an unambiguous statement about the use of violence against children." Convincing, isn't it? This guy likes to spend his time fawning around the likes of the Children's Commissioner, the Families Commission and the CPAG, all hand-wringing do-gooders whose careers turn on rhetoric and dalliance.....or, if I can borrow Mr Bassett's phrase, "placebo" politics. “The Maori Party welcomes the decision by the Government to back down from a hastily thought through plan on managing our freshwater resources”. “Water is a basic human right under international human rights law (United Nations Committee on Economic, Social and Cultural Rights)” said Mrs Turia. 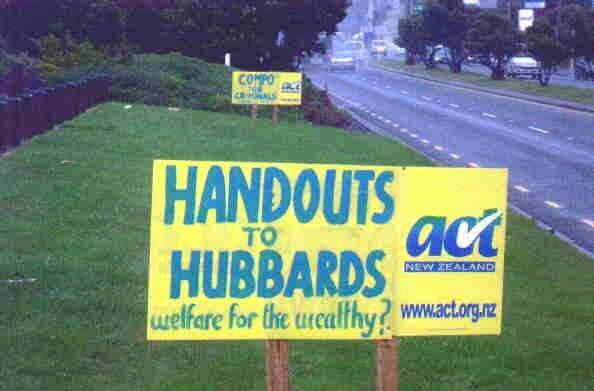 ACT leader Rodney Hide says, "New Zealanders will be disappointed that instead of considering all the options, Labour has fallen back on its 'command and control' ideology. "This is a strategy straight from the bankrupt former Soviet Union. Yesterday I was complaining about the sluggish release of the March 2006 quarter unemployment rate when compared with other countries. Just checked the release schedule for April and the HLFS release doesn't appear. The December quarter release was published on Feb 9. (It would appear) it takes us at least a month longer to publish than the US or Australia. 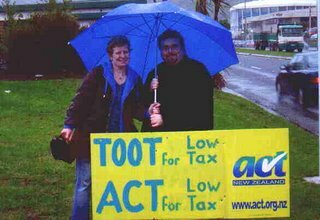 Please Note: Formerly the column The Letter was circulated by the ACT Party. It no longer is. Wellington doctor Carol Shand said yesterday delays were caused by abortion laws, which required women to go through a complex series of steps including numerous medical referrals before they could get an abortion. This report doesn't surprise me having recently accompanied someone to an abortion clinic as support. First, the person has to see a counsellor. Then they have to see a doctor. Then they have to come back on another day to have the abortion. On this occasion the first two processes took three hours (and that was after some queue-jumping). People are herded in, some with partners and children in tow, at the rate of around one every ten-fifteen minutes. The consultations can't possibly keep up with the intake. There is one small women-only waiting room and then a much bigger area with a TV. There is no privacy. Some of the women looked quite distressed and tearful even. This set-up is a sham. And it is leading to unacceptable delays. Back in March I questioned how seven deaths that occurred as a result of domestic violence in 2006 alone could go unreported by the media (I did eventually find one in Chch in early January). Women and children continue to suffer the overwhelming majority of domestic violence abuse, said Commissioner Joy Liddicoat. The National Collective of Women’s Refuges has noted that seven women have died as a result of domestic violence in New Zealand since the start of 2006. "....concerning the number of women that had died as a result of domestic violence.......official statistics for what you have requested no not exist." So my question remains. How reliable is the data propagated by the National Collective of Women's refuge? Ministers claim that in order to shed Scotland's tag as the sick man of Europe, they need to intrude ever further into children's personal health and the private lives of families. Doubtless there are obesity obsessionists here who would leap at such an idea. Watch the s*** hit the fan on this one tomorrow. My kids have been watching this TV3 dance competition for the past few weeks and tonight was the first time that the TV audience could vote by phone. Unfortunately some of the phone numbers given on the programme don't match the contestant (at least one and three have been transposed). So you spend your dollar voting for Leonid and find you have voted for Justin. Couldn't they just count the intentions? Well, no, because when you think you must have pressed the wrong button and ring back, you waste another dollar on the wrong contestant, further skewing the votes. I think they will have to refund the calls. In all jobs, there is a tendency to 'go native'. This is true of diplomats, people sent to Brussels to work for the EU, journalists, lawyers and on and on. People in many jobs start thinking in terms themselves and of the people with whom they come into contact. Those who visit prisons often come to be more concerned about the prisoners they come in contact with than the victims of their crimes, whom they never see. I wonder whether benefit officials come to be more sympathetic to benefit frauds than to the taxpayers these fraudsters are stealing from? 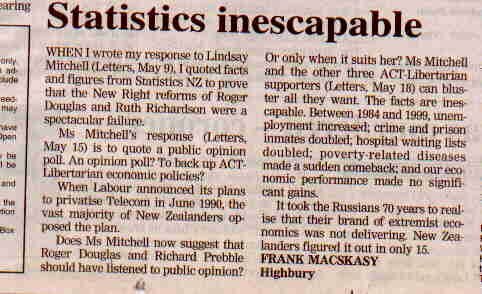 I was making a similar point in this letter published in the Hutt News last week. It responds to a woman who advocates for beneficiaries. I recently read a quote which went something like, just as thought can corrupt language so can language corrupt thought. 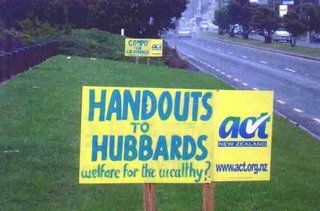 There is an example of this in last week's Hutt News. Speaking about the looming abolition of the Special Benefit, which is a top-up on a main benefit, Teresa Homan said, "The Government has done away with the safety net." It was always my understanding that any benefit is a safety net. But Ms Homan's words reveal that people who advocate for beneficiaries see main benefits as entitlements, with any extra assistance forming "safety nets". That is the viewpoint they impress on their clients. Hence, being on welfare has morphed into a permanent lifestyle for thousands of people. Even the Labour Government has grown concerned about this state of affairs, especially when the newspapers are packed with job opportunities for both skilled and unskilled people. Perhaps even a few hours work could be considered to replace any lost top-up, although I note the main thrust of the article was to urge beneficiaries to get in now before it is too late - in other words, anticipate your hardship. The Washington Times reports, Jobless rate dips to 4.7 percent. Unemployment declined to 4.7 percent last month, approaching a five-year low, as the economy churned out 211,000 new jobs -- a sign of steady economic growth and good news for cash-strapped consumers. In the US "jobless" and "unemployed" are interchangeable terms but not so in New Zealand - a mistake journalists commonly make. NZ's unemployment rate is 3.6 percent but our jobless rate is 6.4 percent. Unless people are actively seeking work they are not officially unemployed. The US gathers its employment statistics in the same way as New Zealand - through a Household Labour Force survey. Their unemployment rate measure is comparable to ours. However, they do not measure a separate category and call them "jobless". And isn't it interesting that a country with a population 72 times the size of New Zealand can get their stats out quicker. Our March statistics have yet to appear. The Aussies beat us to it as well. Their March 2006 unemployment rate is also out and good news for them down to 5 percent.